Knysna, , pearl of the scenic Garden Route, is situated between George and Plettenberg Bay. Perennially green thanks to a Mediterranean Maritime climate with rain falling throughout the year, Knysna is mantled by indigenous forests extending into the Tsitsikamma National Park area. Nestled between the impressive Outeniqua Mountains and the Indian ocean, the culinary capital of oysters and other delectable seafood is a compulsory stopover on every travelers’ itinerary. At the heart of Knysna is a lagoon protected from the sea by the monolithic sandstone "Heads" – best explored on board a catamaran or from along hiking paths in the Featherbed Nature Reserve. A hotspot for art and craft, as well as adventure activities such as tree canopy gliding, kloofing and abseiling, Knysna offers something to everybody. The peculiarity of the origin of the place-name Knysna is commonly explained with a light-hearted joke of two German tourists travelling to Knysna, and upon reaching the lookout point on the eastern Knysna Head, the one says to the other: 'Nice, na?'. On a more serious note, Knysna is believed to be derived from a Khoi word for place of wood, or fern leaves, but most probable straight down or hard to reach - referring to the steep Knysna Heads. Located in the middle of the Garden Route Knysna is easily accessible from Cape Town (about 500 km) and Port Elizabeth (about 270 km). 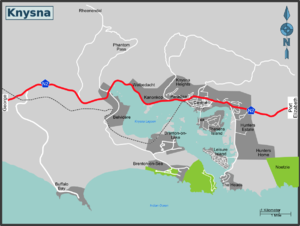 The major bus companies serve Knysna on their run from Cape Town to Port Elizabeth. The Baz Bus stops here too. The nearest airport is in George, while for international flights you have to go through Cape Town. The old railway station is adjacent to the waterfront shopping and restaurant complex, a couple of blocks from the centre of town. Up until 2006 the Outeniqua Choo-Tjoe ran to George via Wilderness and Sedgefield ; however, heavy rainfall and severe flooding in 2006 and again in 2007 caused major damage to the railway route resulting in this train service being suspended. The train was the last-remaining scheduled steam-hauled train service in South Africa, and a not-to-be-missed experience. The train line itself still provides opportunities for viewing and photography: the Kaaimans River bridge (the most-photographed railway bridge in the world) and the bridge over the Knysna lagoon. There is a railway heritage museum in George, alongside the train station. Walking around is the best option or rent a bicycle for longer distances. Except the minibuses there is no public transport so you have to take a taxi if you want. Traffic can become extremely busy during the tourist high season and long queues in and out of Knysna are common. The lagoon: about 18 sq. km and home to at least 200 species of fish is connected with the Indian Ocean through a turbulent channel between "The Heads", two sandstone cliffs. Tour around on one of several boats or just take a coffee at "the Heads". Take a boat across to the Featherbed Nature Reserve on the Heads (this is an organised tour because it's a private reserve, but it's a good way to spend some time on the lagoon than take a walk in the reserve). The Knysna Forest: about 80.000 ha are now under conservation. The ‘King Edward VII’ tree (at Diepwalle forest station) is an estimated 600 years old, 39 m at height, and has a circumference of 6 m. The most famous animals are the Knysna elephants. Currently research, involving DNA testing of dung, is being done to see how many of them may still rumble in the jungle, please report any "dung" sightings! Remember to always take care. There are several hiking trails but you need a car to access the forest. Don't forget the conservation motto "Take only photographs, leave only footprints!". Pledge Nature Reserve: offers 3.5 km of pathways through scrub forest and hillside fynbos with fine views over the lagoon and is just 500 meters of the town centre. A nice place for a walk in the afternoon. Millwood Gold Fields: Site of one of the first gold rushes in South Africa, the Millwood Museum and Materoli Tea Room (be sure to try a piece of Jayne's World Famous Chocolate Cake) offers a unique and fascinating view of the greed, entrepreneurship, energy, and ultimate failure of the first gold discovered in South Africa during the late 1800's. Tours through the old gold diggings are available. Walk along the lagoon, take a coffee at one of the many shops at the waterfront and head straight on for The Heads. There are many golf courses around, often with stunning settings or views. Pezula Championship Course and Golf Club, Simola Country Estate, Golf Club and 5-Star Hotel and Knysna Golf Club. You can also book fully organised or self-drive golf tours in and around Knysna with Platinum Golf . Shops line along the Main St. and the Waterfront. Many restaurants line the main street and the waterfront area. There are so many good restaurants in and around Knysna that you will be spoilt for choice!! Many guesthouses, hotels and B&Bs compete for the visitor in off-season, but in high season prices rise and places fill early so book ahead. There are also several nice options out of town (like Brenton-on-Sea and Buffalo Bay) for those with their own transport. The town has rolled out municipal wifi provided by Uninet. Access is restricted to 45 minutes per user per day. Hike in the Kynsna forest or take a tour in the Outeniqua Choo-Tjoe steam-train to Knysna. Other options are a day tour to Oudtshoorn or the Noetzie castle a few km north east of town. Noetzie Castle - East of Knysna some Britons lost their castles on the beach. Worth some hours or more if you like the beach. This page was last edited on 7 March 2019, at 17:23.